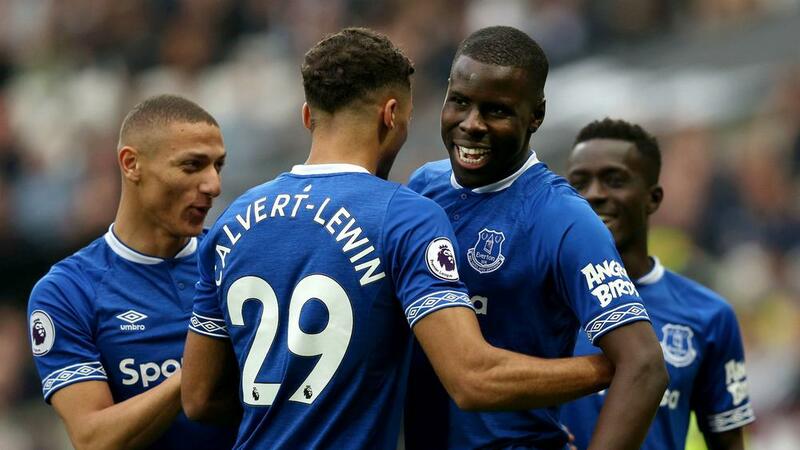 Kurt Zouma and Bernard were on target as Everton comfortably overcame a disjointed West Ham 2-0 at London Stadium in the Premier League on Saturday. Everton went into the international break on the back of a victory over Chelsea and they picked up where they left off to boost their hopes in the race to finish seventh, which could lead to Europa League qualification. Zouma headed the visitors in front early on and Bernard doubled their advantage with his first Premier League goal against the limp Hammers before half-time. A change in formation at the break brought about an improvement from West Ham, but they failed to get a single shot away in the second half and were booed off after a defeat that left them 11th. Everton took the lead inside five minutes when Zouma rose above Issa Diop to head Gylfi Sigurdsson's corner home and the visitors quickly sought another in an open start. Lukasz Fabianski did brilliantly to keep out Dominic Calvert-Lewin and Sigurdsson in quick succession before Lucas Digne cut in from the left and saw his curling shot pushed behind. West Ham eventually found their footing, but Seamus Coleman combined with Richarlison to get in behind and square for Bernard to tap into a gaping net in the 33rd minute. Manuel Pellegrini responded by shuffling his pack, sending on Javier Hernandez and Michail Antonio for the second half, with the Hammers quickly enjoying more possession with an extra man in central midfield. Jordan Pickford remained largely untroubled, though, and Marko Arnautovic - who had been moved out to the left wing - was sacrificed for Grady Diangana in the 67th minute, though he appeared to be struggling with a knee issue. Marco Silva's side were denied a third when Richarlison's powerful header crashed back off the crossbar in the 83rd minute, but enough had been done to close the gap to seventh-place Wolves to just one point. West Ham were completely overrun in the first half, with Pellegrini deploying a 4-4-2 and seeing his side carved apart at will by the visitors. The Chilean manager at least realised his error during the interval and sent them back out in a 4-2-3-1 for the second half. However, West Ham were unable to test Pickford and consequently missed a chance to win a fourth straight home Premier League game for the first time since moving to London Stadium. Everton were cursing their luck when Yerry Mina returned from Colombia duty with a hamstring injury, but Zouma was his replacement and the France international made a telling impact. After opening the scoring early on he produced a solid showing at the other end of the pitch to frustrate West Ham's attackers. With Felipe Anderson missing out due to an ankle injury, Pellegrini changed shape and gave Lucas Perez his first Premier League start in three months. The former Arsenal forward only had one touch in the opposition box and failed to get a single shot away before being replaced by Hernandez at half-time. West Ham will look to bounce back when they face a trip to rivals Chelsea on Monday week, while Everton host Arsenal one day prior.